If there was ever a cat in need of a clean slate, it was Tyrone. So from the moment he arrived at his new home in Cedar Rapids, Iowa, he got to work. "Right now, he's giving himself a bath," his new mom Lori Raleigh tells The Dodo. "He's always cleaning himself. He tries to clean the other ones - as well as us. None of us are ever clean enough." Everything from his old chaotic home, where he was among more than 40 cats rescued from an Iowa hoarder last October, had to go. Everything. Even the name. No longer Tyrone, he would be christened Cubbie. Wonder why? Daddy's a fan. And then, there's this thing he does with a ball. A dog might call it "fetch." But we suspect this little game of returning a ball to the very spot Dan Raleigh throws it from has something to do with everything having to be in the right place. "He trained me," Dan tells The Dodo. "He brings it over and drops it in my hand. Then he gives me a high five." 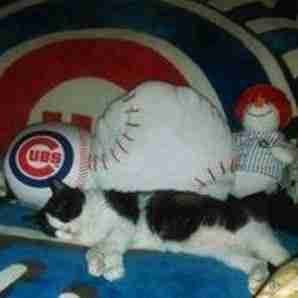 Maybe it's because for too much of Cubbie's life nothing was in its right place. This is how Amy Haas-Gray and Denise Yantis found him back in October. 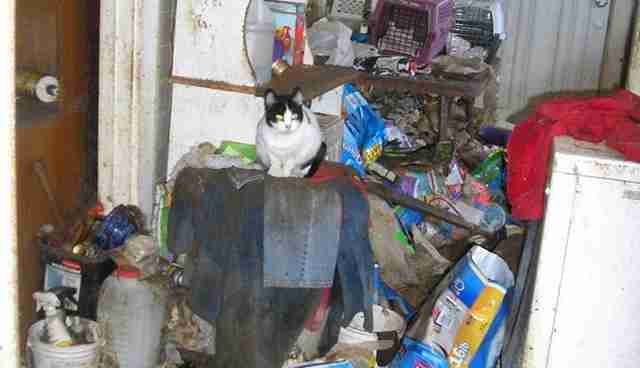 It took two months for Haas-Gray, founder of Hardin Eldora Animal Rescue Team (HEART), working alongside Yantis of Rescue Inn, to find all the cats in this debris- and feces-filled house. The rescues are still looking for homes for scores of them. Cubbie was in the second batch of castaways found. "He was just standing there looking pretty forlorn," Haas-Gray tells The Dodo. "He had big scabs behind his ears and was missing half his hair. 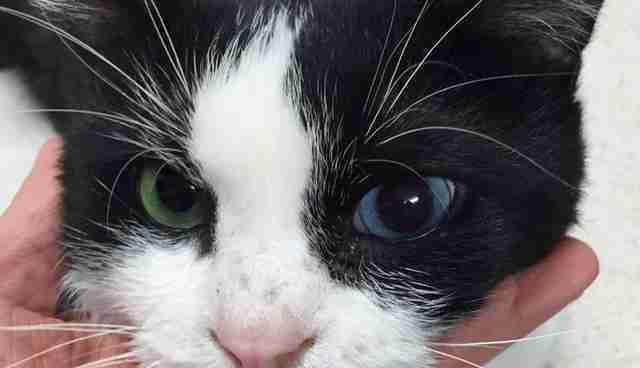 I didn't even know until we got to the vet that he had bi-colored eyes." "All I did for Cubbie was give him a chance, which is something that, historically, cats from hoarder cases don't get, as they are all routinely killed in most larger shelters," she adds. Then the Raleighs saw him up for adoption online and made him their own. 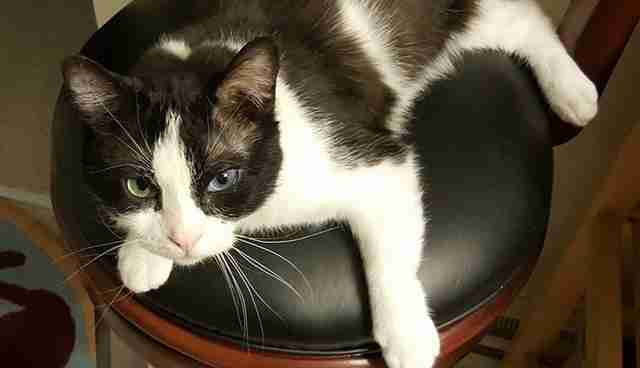 "He's been different from our other cats because of the hoarding situation," Lori says. "He didn't know not to jump on the stove and the refrigerator. We never had to deal with that before." But everything soon came together perfectly. 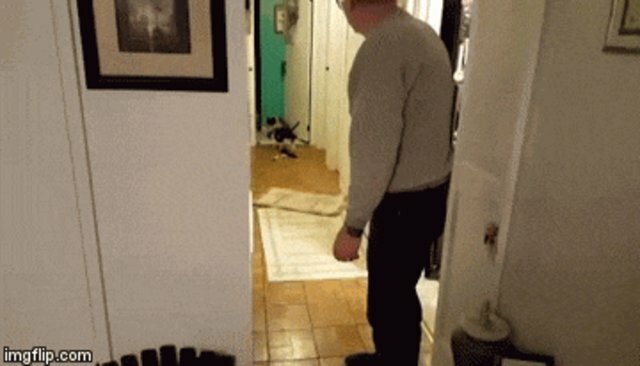 "He watched the other cats and figured out what to do and what not to," Lori said. And then he set his new house in order. 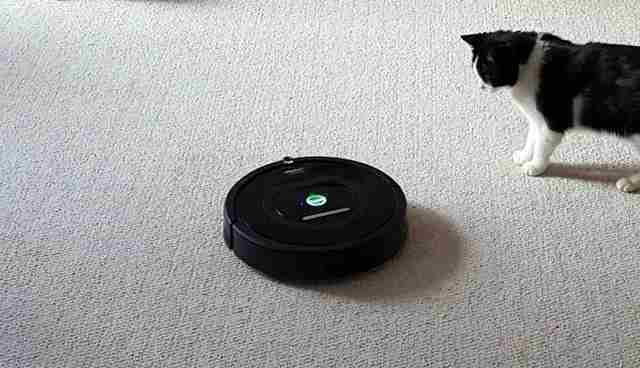 "He cleans himself and he cleans everyone else in the house too," Lori added. Including a certain touch-aversive sibling. "He's got five brothers and sisters and he loves every one of them," Dan says. "But there's one cat - a brother named Gabriel - who won't let any other cat come near him. "Cubbie comes over and cleans him every day now." His new life isn't just about keeping things clean. It's about making repairs too. And sometimes, just as a house must be set in order, so too does a heart need mending. 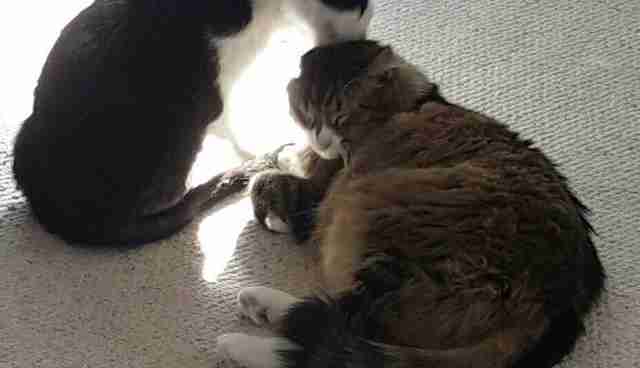 "We lost another cat who was extremely, extremely close to me," Dan says. 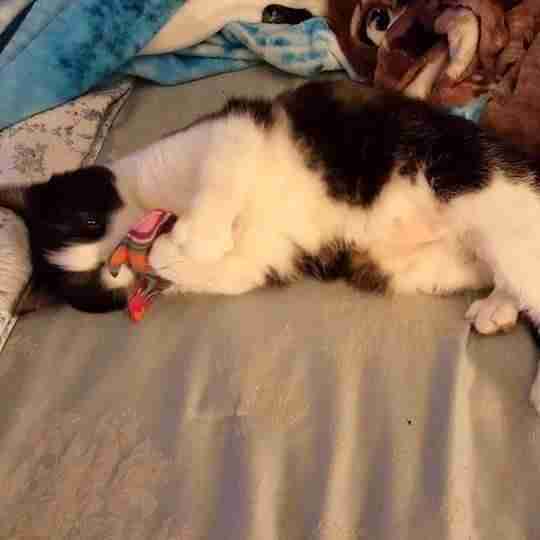 "I had her for 10 years and she had heart problems. She died right after Christmas." "I was kind of heartbroken," he added. "Cubbie fit right in. When we first picked him up, he acted like he was enamoured with me. It was just like, 'Hey I'm going home with you. I'm going to help take care of you.'" 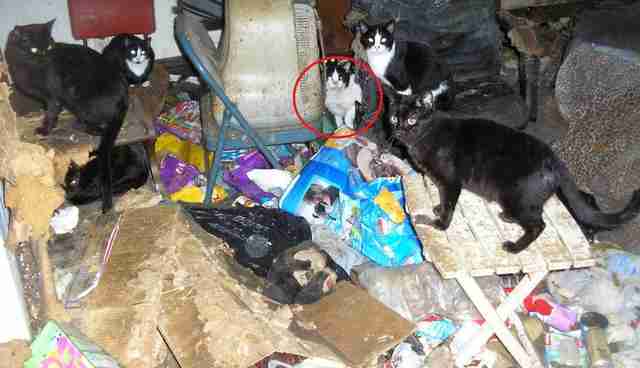 Not all the cats hauled out of that hoarding house in Beaman, Iowa, have found families to rescue. About half are still looking for homes through HEART and Rescue Inn. Think you might want to have your life - and your heart - put in order? Get in touch with HEART through the group's Facebook page. Or with Rescue Inn here. You can also support the other cats rescued from that hoarding home through this GoFundMe page.